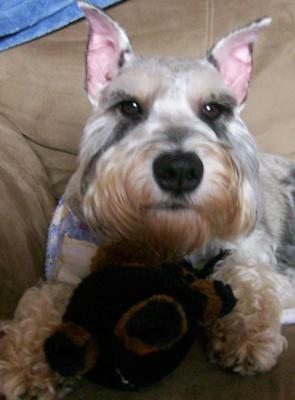 This is Sammy Schnauzer 2 year old salt and pepper. He was adopted on December 28, 2010 after the quick and sudden loss of our dear beloved Bogey. Sammy was sitting at a local animal control surrender by his previous owners. I can tell you one thing and it is scary, Sammy is an angel of Bogey! He acts just like if they were brothers. They play the same, cuddle the same, eat the same, everything! Sammy is a wonderful friend. He loves everyone in our family and has become best of friends with Macey our 5 year old black mini schnauzer. They play and play! We love him more than words can say and I am so glad that he is a part of our family! I still question why someone would give such a loving and dear friend away! But it doesn't matter because he is ours forever! We love you Sammy! Someone once told me that the dog picks you ~ you don't pick the dog! Sammy sound like a perfect fit for your family. 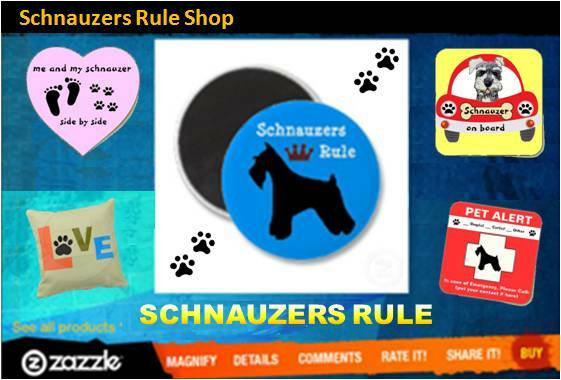 Aren't Mini-Schnauzers the best!?! He is the perfect friend for me! And he is mommy's boy!